CFA signs MOU with GET Africa in Accra, Ghana. From left to right, Dr. Jamechia Hoyle, Deputy Coordinator of CFA’s AHIC; Professor Akin Abayomi, Principal Investigator, GET Africa; and Ambassador Bonnie Jenkins, Member of the CFA Board of Directors. 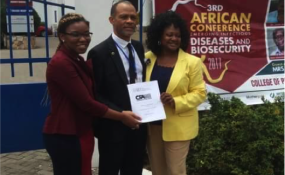 The Constituency for Africa (CFA) announces the signing of a historic Memorandum of Understanding (MOU) with the Global Emerging Pathogens Treatment Consortium (GET Africa). GET Africa is a predominantly African led, non-profit consortium registered in Ghana, Nigeria, and the United States with membership drawn from 35 African countries and growing. GET Africa was established in 2014 as a direct response to the Ebola virus disease outbreak in West Africa and the need to create an African-led multidisciplinary forum of experts capable of working together to strengthen Africa’s preparedness and resilience in tackling such infectious disease outbreaks caused by emerging pathogens, public health emergencies, and pandemics. GET now operates firmly in the African Biosecurity space and functions as a think tank, providing high level advocacy, operational support, and expertise in support of countries’ and communities’ efforts to improve their resources for combatting outbreaks that can threaten stability, peace, and security. More information on GET Africa is available at www.getafrica.org. For over 26 years, CFA has established itself as one of the leading, non-partisan organizations committed to educating and mobilizing stakeholders throughout the U.S. and the Diaspora on Africa-related issues. One of CFA’s primary initiatives is its African Healthcare Infrastructure Committee (AHIC). The mission of CFA’s AHIC is to organize impacted stakeholders in the U.S., Africa, and throughout the Diaspora to collaborate, develop, and promote initiatives to increase efficiencies in health systems that strengthen the effectiveness of healthcare infrastructure and the pipeline for human resources for health on the African continent. “I am excited about CFA’s MOU with GET Africa. Not only does this new relationship fully align with the mission and objectives of CFA’s AHIC, this relationship provides CFA with direct access to some of the leading African healthcare experts on the ground throughout Africa,” stated Mr. Melvin P. Foote, CFA’s President and CEO. CFA and GET Africa will collaborate in a number of areas, including research in emerging infectious diseases and biosecurity; policy education, advocacy, outreach, and implementation in the area of emerging infectious diseases and biosecurity in Africa and throughout the Diaspora; and support of early detection and response to infectious diseases in Africa. CFA’s 2017 Ronald H. Brown Series will be held from September 18th through September 22nd in Washington, DC. The theme of this year’s Series is “Mobilizing the Diaspora in Support of the U.S.-Africa Agenda.” The purpose of the Series will be to bring together stakeholders from the U.S., Africa, and throughout the Diaspora to assess the U.S. Administration’s Africa policy, and to identify challenges and opportunities in a number of key areas, including Healthcare Infrastructure, Democracy & Governance, Trade & Investment, Next Generation of Leadership, Agriculture, and Diaspora Engagement. CFA and its partners will produce a Diaspora strategy to include policy recommendations for the U.S. Administration and the African Union. For more information on this year’s Ronald H. Brown African Affairs Series and to register for events, please visit www.ronaldbrownseries.org.